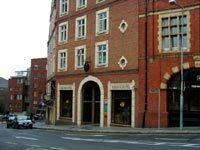 Part of the Latteridge group of Irish hotels and restaurants, The Harding Hotel situated in the heart of Dublin offers great value for money and attention to detail. Copper Alley which is Dublin’s oldest street and full of bohemian charm actually runs through the reception area. The hotel is charming and modern and this combined with the friendly staff will make a visit to Dublin a very memorable one. The hotel offers 53 charming en suite bedrooms all fitted out with the necessary facilities for comfort and convenience. Facilities include direct dial telephone, remote control cable television, and hairdryer, tea coffee making facilities, safe facilities and luggage storage. Many of the bedrooms can comfortably sleep three people. Cots and high chairs are available as are lifts and facilities for people with special needs. The guest can avail of Bureau de Change and tourist and travel information booking service. The hotel offers corporate meeting rooms which cater for between 12 and 15 people. Darkey Kelly's Bar & Restaurant offers an excellent range of cuisine all prepared to top class standards by dedicated chefs. After a hard day in Dublin sightseeing, shopping or attending business meetings an evening of lively music and a pint of Guinness is the perfect way to unwind. A great range of traditional Irish and contemporary live music feature in the bar many evenings during the week and is very popular with both visitors and locals. Situated in the famous Temple Bar district, Temple Bar is famous for its pretty cobblestone streets, quaint shops and pretty coffee shops. It is a very popular area with the bohemian free spirit people and also a popular area for stag parties. Temple Bar is also famous for its pubs, cafes, restaurants and galleries. All major tourist attractions are close by, Trinity College, Dail Eireann, The National Museum and The National Gallery. And not forgetting Grafton Street, Irelands most famous shopping street and contains a wide range of shops and is always full of beans with the sound of music of laughter.